SAN JOSE, Calif., December 8th, 2010 – Visual productivity software maker CS Odessa today introduced an industry first with ConceptDraw Office 2.0, which now gives business professionals single-click access to integrated solutions for project management, brainstorming, report writing, and much more. The latest ConceptDraw Office suite release is being launched in tandem with the new ConceptDraw Solution Park online resource center. 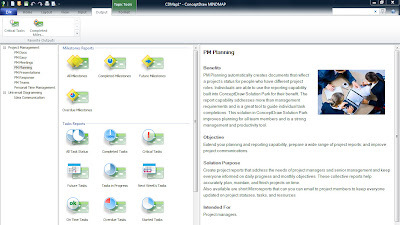 ConceptDraw Solution Park features integrated business productivity solutions that bundle ConceptDraw software, templates, and “how-to” guides to get business users up and running quickly. Central to the $499 ConceptDraw Office 2.0 suite is the new ConceptDraw Solution Browser. Through the browser, users can view available solutions on ConceptDraw Solution Park and click on the solution they want. ConceptDraw Solution Browser then automatically loads any software, templates and guides supporting the chosen solution. Version 2.0 also significantly enhances seamless integration of the suite’s ConceptDraw MINDMAP for mind mapping and brainstorming, ConceptDraw PROJECT comprehensive project management software, and ConceptDraw PRO for business diagramming and scoreboard development and display. 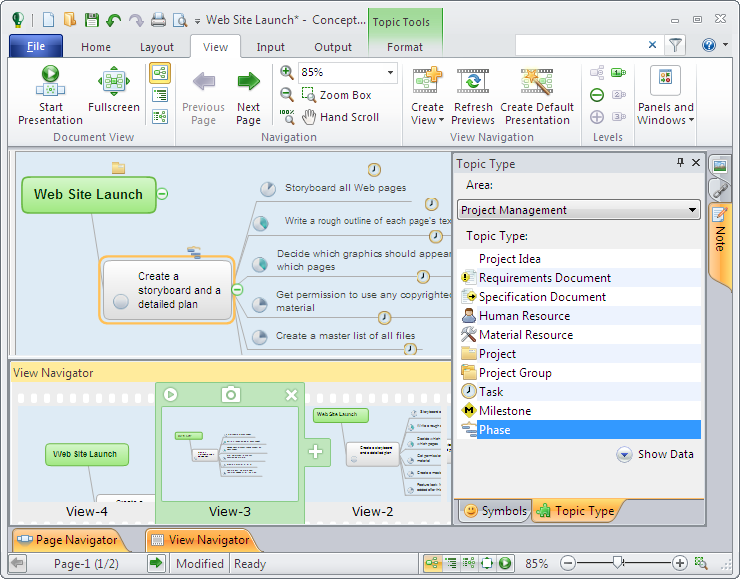 For example, a user can brainstorm in ConceptDraw MINDMAP and then click once to automatically generate a project chart in ConceptDraw PROJECT. Now users can focus on the business need instead of integrating technology. ConceptDraw Office 2.0 is the only visual productivity suite that includes support for the latest versions of Apple Macintosh OS X and Microsoft Windows in the same package. As a result, individual users only need one ConceptDraw Office license to run the suite on both systems. 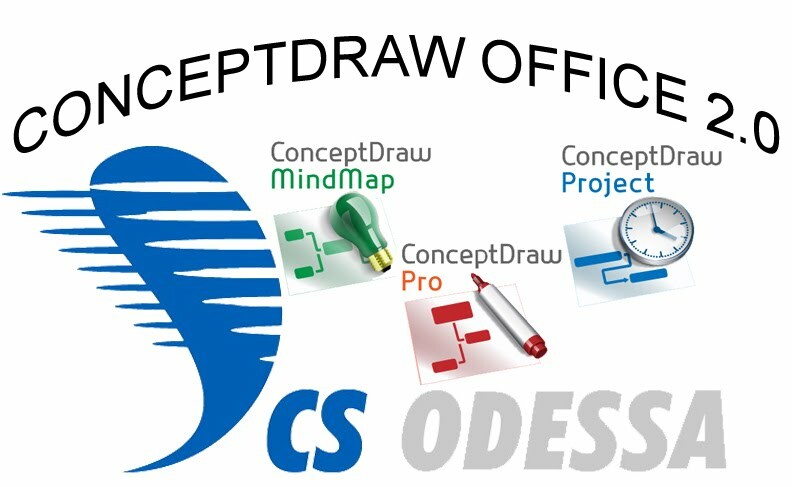 ConceptDraw Office 2.0 is the flagship product for CS Odessa. 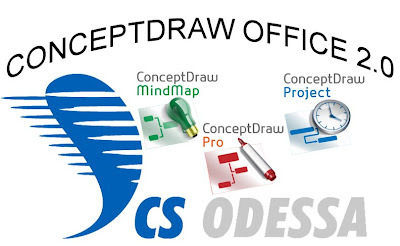 It includes ConceptDraw MINDMAP, ConceptDraw PRO, ConceptDraw PROJECT, and ConceptDraw Solution Browser, which are integrated through CS Odessa’s INGYRE 2 technology and extended by the new ConceptDraw Solution Park. The integrated visualization products and document exchange technologies provide all the tools essential for generating business diagrams, mind maps, project plans, dashboards, presentations, schematics, and any other business visualizations. In addition to the new ConceptDraw Solution Browser, Version 2.0 also includes several new features and enhancements to ConceptDraw MINDMAP, ConceptDraw PRO, and ConceptDraw PROJECT. ConceptDraw MINDMAP: is a powerful business and personal productivity software application that provides visual organization and access to information for individuals and organizations. The newest release is the first mind mapping product to support collaboration through many-to-many communication. 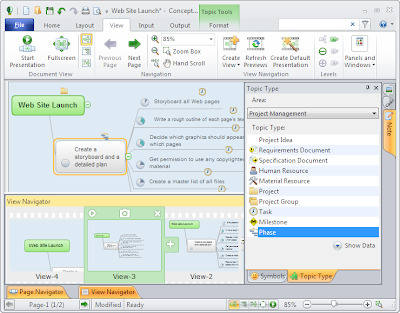 New features include the ability to output to virtually any format, as well as rapidly input information, with a single click; the availability of five presentation styles to accommodate any situation, from informal to formal presentations; and a new map template to provide maximum visual impact for brainstorming, analysis and presentations. ConceptDraw PRO: is a powerful business and technical diagramming software tool for designing professional-looking graphics, diagrams, flowcharts, floor plans, and much more in just minutes. The latest release adds more than 10,000 new drawing objects, plus the new Rapid Draw feature, which dramatically cuts drawing times for complex flowcharts and diagrams. It also features ConceptDraw’s Live Object technology for a level of sophistication unavailable with other drawing packages, including the ability to build dynamic dashboards that are updated from external data, such as desktop applications, enterprise data sources, and Web sources. Mind map data also can be quickly rendered in ConceptDraw PRO as a fishbone diagram, organizational chart, and UML diagram, to name a few. ConceptDraw PROJECT: project management software enables project managers to analyze the progress of projects and optimize the utilization of available resources. Used within ConceptDraw Office, it also manages all workflow tasks and provides powerful dynamic dashboards that clearly reveal the state of any project, including any associated key performance indicators. 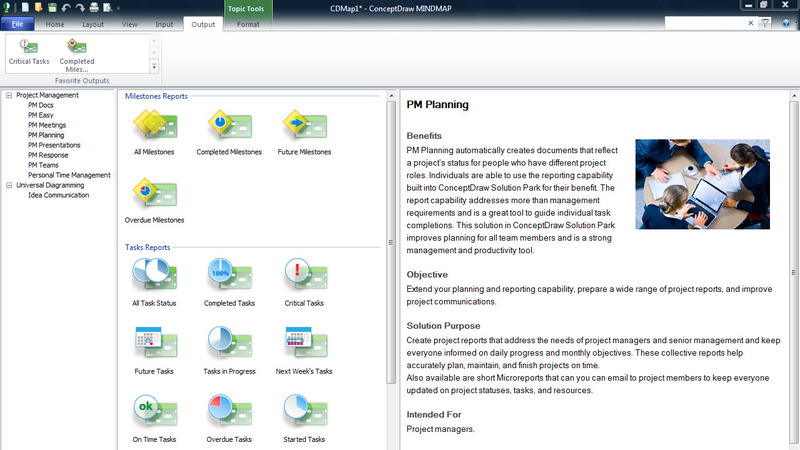 An innovative dashboard describes project readiness by displaying the documentation that is associated with each task. The latest release extends reporting capabilities through enhancements to tools for managing tasks and resources, expands the dashboard support, and improves export and import functionality. SAN JOSE, Calif., December 8th, 2010 – Visual productivity software maker CS Odessa today announced ConceptDraw Solution Park. The innovative new online resource center features integrated business productivity solutions that bundle ConceptDraw software, templates, and “how-to” guides to get business users up and running quickly. 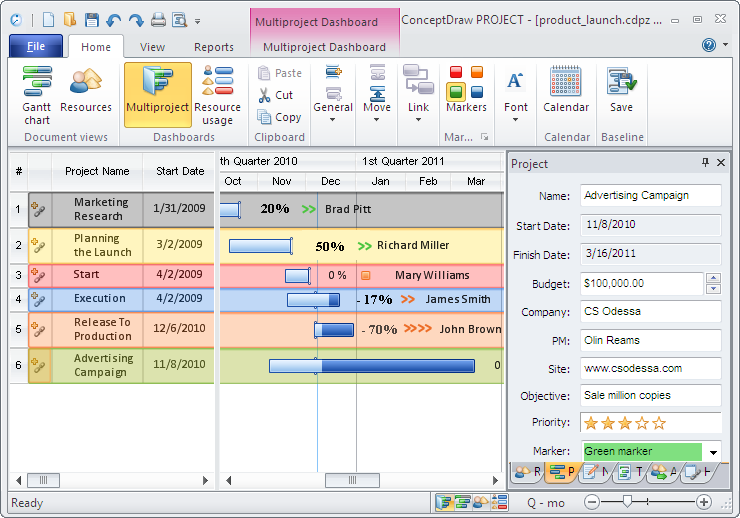 ConceptDraw Solution Park is being launched in conjunction with the ConceptDraw Office 2.0 suite. Together, they give business professionals single-click access to integrated solutions for project management, brainstorming, report writing, and much more. ConceptDraw Solution Park extends the value of ConceptDraw Office 2.0, which includes the seamlessly integrated ConceptDraw MINDMAP for mind mapping and brainstorming, ConceptDraw PROJECT comprehensive project management software, and ConceptDraw PRO for business diagramming and scoreboard development and display. Through the ConceptDraw Solution Browser in ConceptDraw Office 2.0, users can view available solutions on ConceptDraw Solution Park and click on the solution they want. The ConceptDraw Solution Browser then automatically loads any software, templates and guides supporting the chosen solution. Now users can focus on meeting business goals instead of integrating technology. 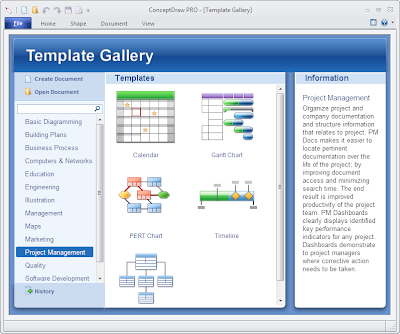 The initial release of ConceptDraw Solution Park features solutions in three professional areas: Project Management, Universal Diagramming, and Business Productivity. Each solution provides instant access to task-specific software tools, templates and guides for business activities—for example, create a team assignment calendar, run a brainstorming meeting, plan project phases, and create a project PowerPoint presentation for management, to name a few. All of these solutions are based on the real-world use cases of hundreds of thousands of business professionals already taking advantage of ConceptDraw software. Additional professional areas will be added in subsequent updates, and third-party solutions will begin joining those from CS Odessa in 2011. ConceptDraw Office 2.0 is available today for $499. It includes ConceptDraw MINDMAP, ConceptDraw PRO, ConceptDraw PROJECT, and ConceptDraw Solution Browser. ConceptDraw Office 2.0 can be downloaded at http://www.conceptdraw.com/office2. For users who wish to purchase standalone products, pricing is $219 for ConceptDraw MINDMAP, $249 for ConceptDraw PRO, and $219 for ConceptDraw PROJECT. About CS Odessa Founded in 1993, Computer Systems Odessa supplies cross-platform productivity tools and graphics technologies to professional and corporate users around the world. With headquarters in Odessa, Ukraine and North America operations in San Jose, California, CS Odessa sells products internationally through resellers in over 25 countries. The ConceptDraw Productivity Line of products has won numerous awards and is used by hundreds of thousands of people all over the world. For more information, visit www.conceptdraw.com.